Our vision is to create an iconic neighborhood-defining community that provides quality spaces where people can live, work, shop and dine. We start with identifying a concept for a neighborhood and being an agent of positive change. We create not only a place to live and work, but also a growing and thriving community. This website will tell you all there is to know about our “Gateway at Millbrae Station” project. Thanks to the support of Millbrae residents and local community leaders, we are working hard to make this project a reality. In the midst of a housing crisis, Gateway will fill a long-standing need, and in the best location for 400 new rental homes — near transit. The increase in housing stock will help Millbrae do its part to mitigate rising rents in the area, while avoiding displacement of existing housing. Gateway will also provide 80 units of affordable housing, significantly higher than required by the City’s specific plan for the area, as well as 320 apartments for middle-class residents. 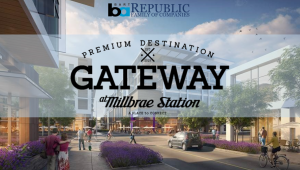 Thank you for your interest in “Gateway at Millbrae Station.” By working closely together with the community, we will ensure that this project is a great success that will improve the quality of life for Millbrae residents and revitalize the local economy. In the midst of a housing crisis, Gateway is filling a long-standing need, and in the best location for 400 new rental homes — near transit. The increase in housing stock will help Millbrae do its part to mitigate rising rents in the area, while avoiding displacement of existing housing. Gateway will provide 80 units of affordable housing, significantly higher than required by the City’s specific plan for the area, as well as apartments for middle-class residents. Qualified military veterans will be given first priority for 55 affordable apartments. These veterans who may be priced out of the local rental market will benefit from affordable homes as well as a community room and gym. Distinctive architecture, enhanced open space and appealing retail shopping will be hallmarks of Gateway at Millbrae Station. By creating an attractive place for people to live, work, shop, and dine, Gateway will complement and connect Millbrae’s existing downtown area to the BART/Caltrain station. Walkable and bikeable civic spaces will offer residents and commuters the opportunity to shop, socialize in the plaza, relax in open spaces throughout the property, or grab a bite to eat at a sidewalk café. As an environmentally-friendly site, Gateway will include the latest energy-efficient and water-saving features. With access to BART/Samtrans/Caltrain and local shuttle buses, residents and workers will have the opportunity to take transit and shuttles to their jobs/homes, instead of commuting via car – thus limiting congestion and greenhouse emissions. And downtown Millbrae shopping is just half a mile away. Gateway will also provide a multitude of walkable and separate bikeable pathways to increase accessibility in the area. The Bay Trail also will be extended, allowing easy access to the trail. Visitors, workers and residents will enjoy a variety of amenities, to include bike racks, secure bicycle parking, and a bike repair facility. Gateway will generate millions in new tax revenues, adding more than $400,000,000 to the City’s property tax rolls and contributing more than $1,400,000 to Millbrae schools in fees alone. Surplus tax revenues will also provide better funding for vital services for Millbrae residents, such as police, fire, and parks and recreation. Gateway will be the greatest economic stimulus Millbrae has received in decades, providing major fiscal and economic benefits. The new community includes a hotel to serve visitors using transit, new homes, and job-creating offices and retail. Once completed and occupied, the operations of the office, retail, and hotel spaces are projected to generate an on-going economic impact on the local economy as tenants produce sales, pay wages to employees, and purchase goods and services from other businesses in the local economy. The on-going operations from commercial and hotel tenants and the expenditures of multi-family households are forecasted to generate a total annual economic output of $390 million within the local Millbrae economy. Gateway will generate tens of millions of dollars for BART from ground lease rent payments. The additional revenue generated will help fund key infrastructure improvements for BART including for Millbrae Station. I support the Gateway Proposal at Millbrae BART Station, which creates critically-needed rental housing (400 homes) and will add more than $400,000,000 to the property tax rolls for the City of Millbrae. The proposal benefits local merchants, creates attractive open space and includes a bike/pedestrian bridge on the Bay Trail. With the new community located adjacent to the Caltrain and BART station, we believe this is an environmentally-friendly way to grow Millbrae, both for residents and existing businesses. This proposal provides retail space, office and a hotel, plus 55 affordable veteran-preferred rentals, along with $1,400,000 in school fees for Millbrae. I support Gateway! The City is undertaking a process to update the Millbrae Station Area Specific Plan (Specific Plan), which was initially developed and adopted in 1998. The Specific Plan would guide future public improvements and private development in the Plan Area over the next 25 years. Associated with the Specific Plan update are General Plan and Zoning Ordinance Amendments which would also need to be updated in order to be consistent with the new Specific Plan. Consistent with the California Environmental Quality Act (CEQA) Guidelines, an Environmental Impact Report (EIR) has also been prepared. The EIR serves as both a program-level document that analyzes the potential impacts of adopting and implementing the Specific Plan Update and its buildout potential, along with the associated General Plan and Zoning amendments. The EIR also serves as a project-level EIR that analyzes the potential impacts of constructing and operating two specific development projects in the Plan Area referred to as TOD #1 and TOD #2 (described below). This process does not consider entitlement approvals for either TOD#1, or TOD #1; it includes only an environmental analysis of the two TOD projects in accordance with the CEQA guidelines. Entitlement consideration for both TOD#1 and TOD#2 projects would occur at a later date, under separate processes and public hearings. TOD #1 Project: The proposed TOD #1 project proposes new mixed-use development on the Millbrae Serra Station properties (Applicant), which are located immediately west of the Millbrae Station. The TOD #1 project proposes to construct 267,000 square feet of office space, 32,000 square feet of retail space, and 500 high- to medium-density multi-family residential units, which is estimated to result in up to 1,325 residents and 1,148 employees. The project also includes underground parking and an enclosed galleria retail corridor connecting Serra Avenue to the Millbrae Station platform. TOD #2 Project: The proposed TOD #2 project proposes a mixed-use project for a BART-owned site that is located immediately east of the Millbrae Station. The TOD #1 project proposes to construct 164,535 square feet of office space, 46,935 square feet of retail space, 321 high- to medium-density multi-family residential units, and 116 hotel rooms, which is estimated to result in up to 851 residents and 868 employees. In addition, the proposed TOD #2 project would relocate the bus intermodal facility and existing surface parking spaces.